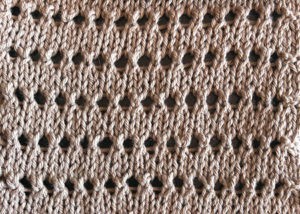 When I first saw pineapple stitch, I couldn’t figure out why this simple but elegant stitch was given such an odd name. On closer inspection, I suddenly realised! It’s made up of thousands of tiny pineapples! 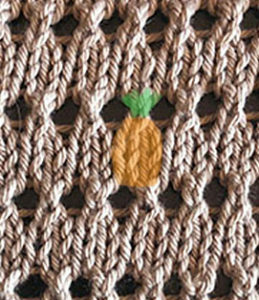 Pineapple stitch was particularly popular in the 1930’s and 40’s, often seen on the short sleeve tops that were a staple garment in the era. Pineapple stitch looks particularly nice worked in a smooth yarn, although a very fine and subtle bouclé would make a very interesting fabric. I hope you’ve enjoying my little knitted stitch pattern feature over the past few weeks. I have five stitches left in this series. If you’d like to be notified via email whenever I post a new stitch or pattern, you can sign up over on the left (if you’re on a desktop or laptop computer), or beneath this post on tablets or mobile. I never share anyone’s email address with any third parties and will only use it to notify you of new posts.